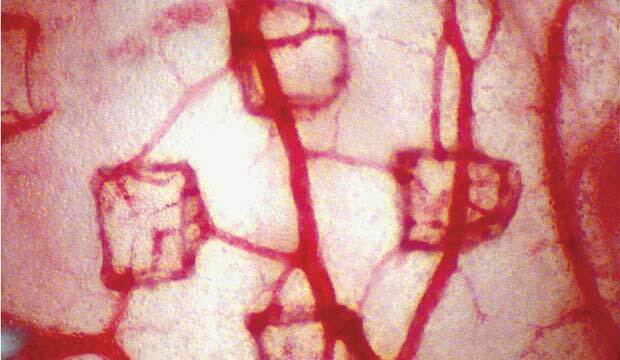 Researchers have developed a way to coax new blood vessels to grow with a specialized bandage. Covering a deep wound with a bandage might one day offer much more than protection and a platform for a dressing. By seeding live cells on a “microvascular stamp” and affixing it to tissue, researchers at the University of Illinois have coaxed new blood vessels to grow. For a week, the cells in the centimeter-square patch exude proteins that stimulate the formation of blood vessels, following the stamp’s pattern, which is precisely arrayed to allow vessels to function (if the vessels are too far apart, for example, they can’t transport oxygen or nutrients to cells). Thus far tested only in chicken embryos, the stamp promises a number of applications: rebuilding tissue damaged by deep wounds or defects in bone or muscle; strengthening blood vessels feeding tumors, to allow more chemotherapy to flow through them; and reducing scar tissue after surgery.